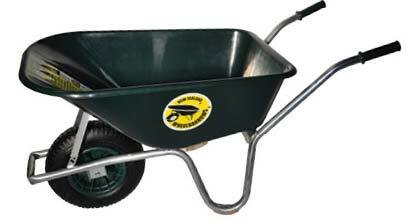 A smooth, reliable, strong, and light wheelbarrow for garden and light DIY applications around the home. It is a tough and practical wheelbarrow that we believe is extremely good quality and value. This is a very common European design of wheelbarrow, and the pedigree stands out. The tray and frame are designed so it stands on its nose and you can store it against a wall. Impact resistance factor of 8. Eight inch wheel with 4.80/4.00-8 tyre. "This wheelbarrow is a perfect mating of the incredible hulk and a ballet dancer. It has the best characteristics of both! This is the best behaved wheelbarrow I know, Mum will love it too!"